Go to the UPS.com site for the most up to date delivery schedule, based on your location. We ship from Hudson, Massachusetts 01749. In stock items placed by 1 pm EST, Monday-Friday (excluding Holidays) will ship the same day. Items ordered after 1 pm on Friday will ship on the next business day. Items not in stock will take up to 5 business days to produce from the time we receive your order. We ship all of our orders via UPS Carbon Neutral Shipping, and offer three delivery choices: UPS Ground, UPS Next Day Air, and UPS Second Day Air. 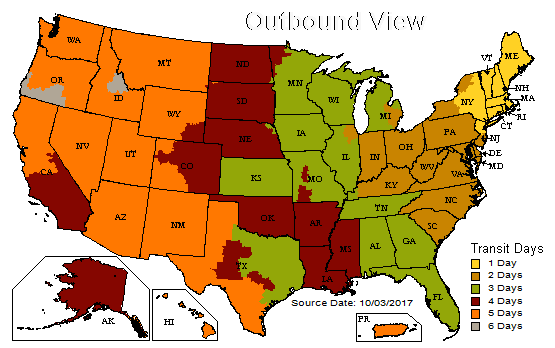 For UPS Ground orders, your delivery time will depend on what zone you live in, please see the UPS Zone map as an estimate for your location (Orders originate in Massachusetts).